TCS Woodworking designs and builds custom office furniture for a variety of purposes and business types throughout the greater Baltimore area. If you’re opening a new office, renovating an old one or expanding, custom office furniture can help set the tone for your home office or business location. Whether you want sleek and modern, or custom office furniture that looks old (antique) but functions like new, we are up to the task. Need a custom desk for your doctor’s office or reception area? Just call TCS Woodworking. We can design and build a custom desk or desks that add beauty and function to your workplace. We’ll take care to match the wood to any existing wood features and take exact measurements to ensure your custom desk or desks last for years to come. We can build custom office furniture using reclaimed wood, or any wood of your choice, including exotics. Our craftsmen will work with you to come up with a custom wood furnishing design that takes into consideration not only the space involved, but your work style, budget, and aesthetic preferences for your custom furniture. Our handcrafted custom built office furniture will make going to the office a pleasure. 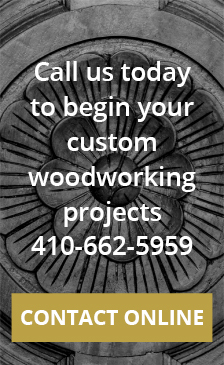 For more information or for a quote on Custom Furniture or Custom Cabinets, call 410-662-5959 or Click here to email us! @ 2018-2020 TCS Woodworking Custom Furniture & Cabinets.